Let’s Seed the Future… Let’s Harvest the Gold! 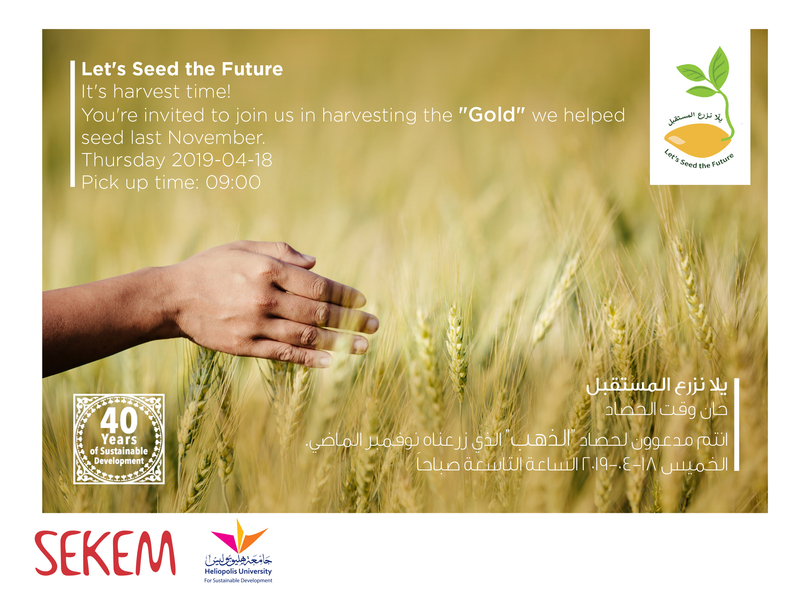 SEKEM invites you to the second phase of Let’s Seed the Future event, next Thursday April 18 on SEKEM’s main farm. We want to harvest the wheat we planted last November under the slogan 100% Organic, one of SEKEM’s main projects in the Vision for 2057. Last November, SEKEM community got together to plant the seeds for Egypt’s Organic future. The invitation was extended to everyone who was interested and willing to point the way for a sustainable future. Next to students from SEKEM School, School for Children with Special Needs, the Vocational Training Center and Heliopolis University for Sustainable Development also SEKEM friends from all over the world came together to plant the seeds. Starting from November, pupils from local university and school regularly visited SEKEM in order to join the campaign. (erforderlich) Mit dem Absenden des Kontaktformulars stimmen Sie zu das SEKEM Sie bzgl. Ihres Anliegens kontaktieren wird und erklären sich mit unserer Datenschutzerklärung einverstanden. Sie können sich jederzeit aus unserer Verteilerlist austragen.